I am overweight and out of shape. This is not easy for me to admit, especially as someone who has worked in the outdoor industry for two decades. I’m an active hiker and adventurer, and I’d always relied on getting outdoors to stay fit. But now that I am in my forties, shedding pounds is tougher than ever. I’ve tried a lot of fitness gyms over the years, but I had never enrolled in an organized workout class in my life. 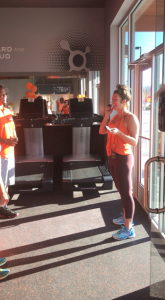 So I was both skeptical and nervous when I enrolled for a month of classes at Orangetheory Fitness Asheville. Okay, I was more than nervous: I was freaking out. 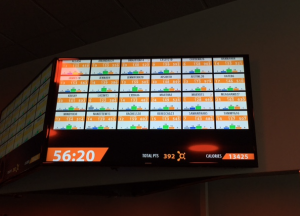 I knew only one thing about Orangetheory: High Intensity Training. That sounded way out of my league. I couldn’t do a single push up. But I promised myself to give it a try. I had nothing to lose—except maybe a few pounds. 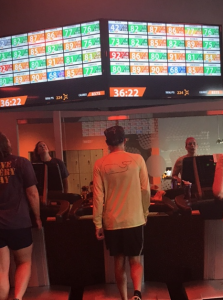 I walked in to the Orangetheory studio, and it was beautiful: light-filled, open, with glass walls separating the workout studio from the lobby. 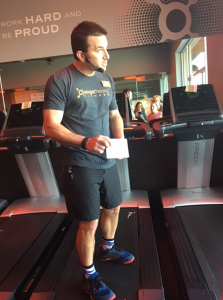 I checked in at the desk, where I was given a chest strap heart-rate monitor, which is synced to the screen in the workout studio. 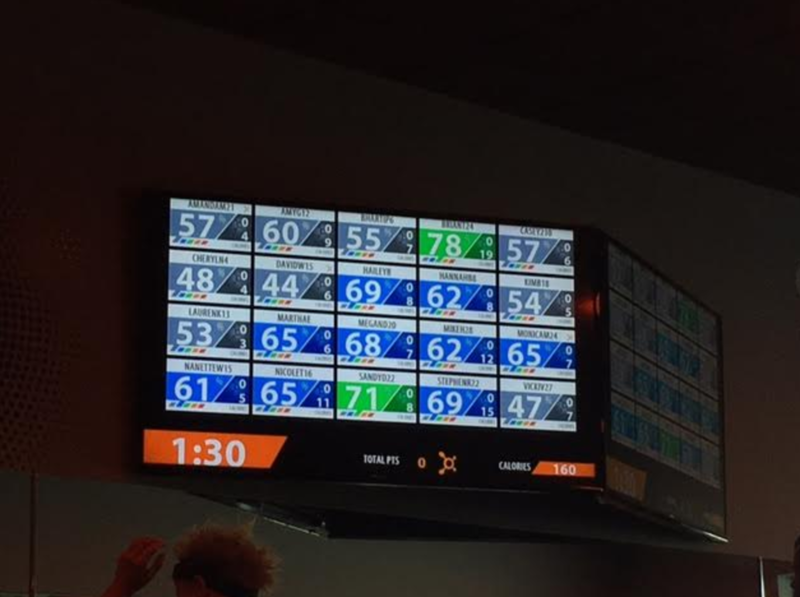 The screen displays every class member’s first name, heart rates, calories burned and target zones are made simple, as they are color-coded. OT screen during class…18 mins and 36 mins. Orangetheory is based on a simple principle: elevate your heart rate through high-intensity training for 12 minutes or more each one-hour workout. 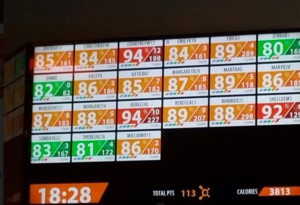 Heart rates are divided into zones, and the goal of each class is to spend 12 or more minutes in the orange zone or above—which is roughly 84 percent of your maximum heart rate. 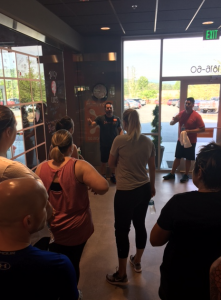 Our instructor, Aaron Ostwald, was a friendly, smiling instructor who quickly dispelled some of my anxiety by giving me a high-five as I walked in. There were about 20 others in the class, and they weren’t all young and super-fit as I’d imagined. There are high schoolers and senior citizens, but most of them are middle-aged women like me. Wearing a headset, Aaron offered a few opening words of inspiration, and then cranked the music full-volume. Since today’s workout focused on 90-second intervals, Aaron selected a mix of upbeat 90s songs: Backstreet Boys, Britney, Alanis, R.E.M, and even a little Marky Mark and MC Hammer, too. 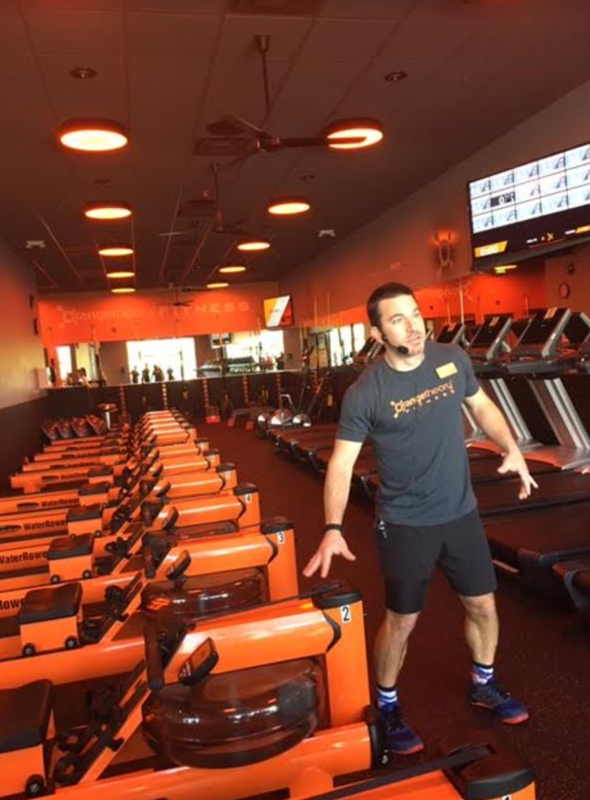 Coach Aaron explaining treadmill workouts. 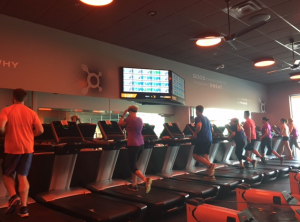 Classmates moving on the treadmills. 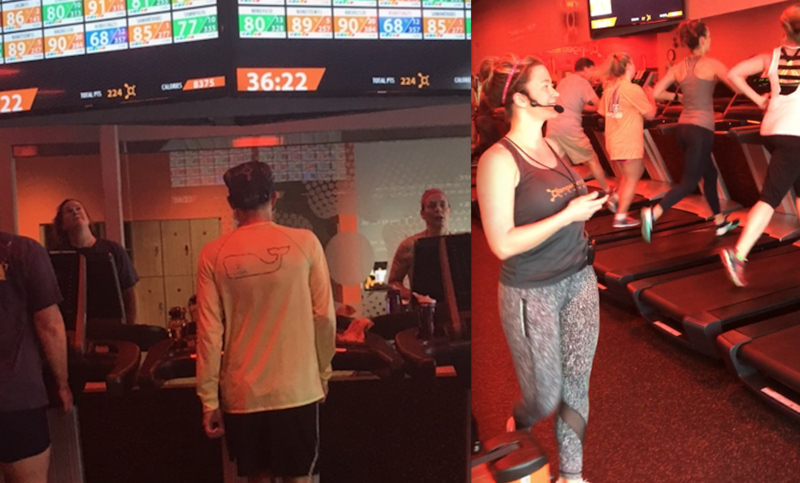 Our class broke into two sections: half of us started on the treadmill, and the other half began on the rowing machines. For the next thirty minutes, I power walked, as fast as I could, and even tried to run a little—something that does not come easy for me at all. 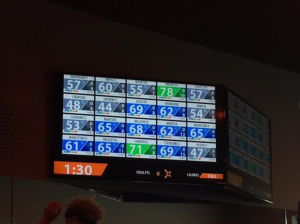 As I worked harder, I saw my color-coded heart rate on the big screen at the front of the studio and the numbers were going up. 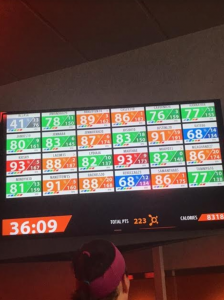 Every few minutes, Aaron pushed us to pick up our pace and push ourselves to the orange zone for a minute or two and then recover to and try to get back down in the green heart rate zone. 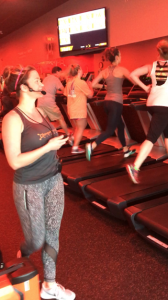 Aaron helped me tweak my form while I tried not to get blown off the back of the treadmill. 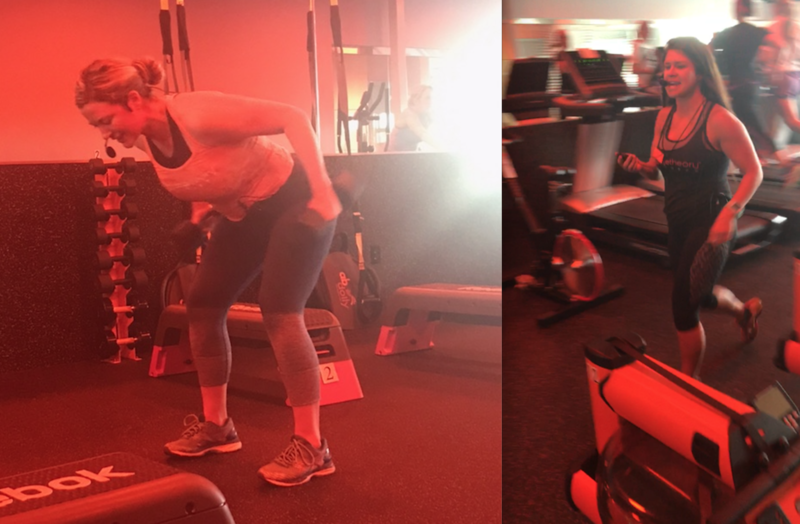 After about twenty-five or thirty minutes of cardio, my half of the class switched to the rowing machine and strength training. I’d never been on a rowing machine, but Aaron coached me through it, and by the end of the class, I felt ready for a regatta. The strength training was especially tough, though. 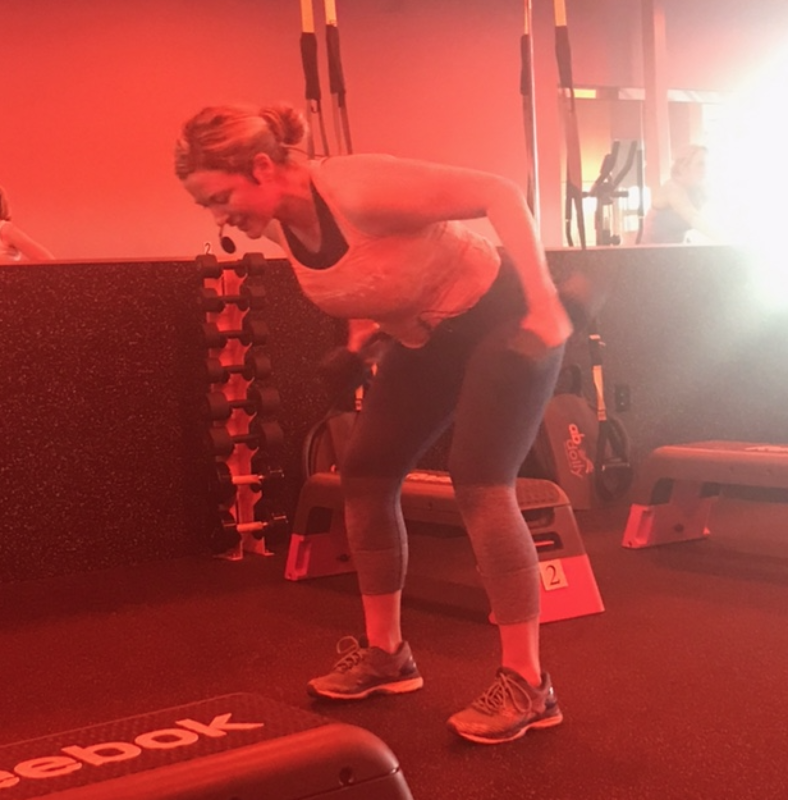 I used my knees to do half push-ups and barely made it through the burpees. My core strength is nonexistent, but at least I know what exercises to expect next time. 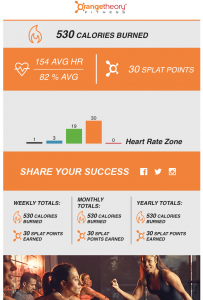 The coolest thing about my first day of Orangetheory Fitness Asheville, was the performance summary that I received via email after the class. 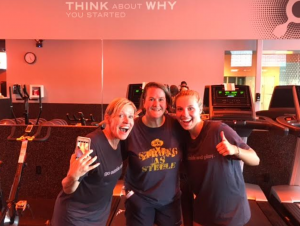 The workout went by so fast and I was off to work and then boom…there was my proof, my reminder, my encouragement…earlier that day in the workout, I’d burned 530 calories, earned 30 splat points, and my average heart rate was 154, which was 82% avg of max. I was so proud of that! Sometimes I still feel like I’m going to throw up after each class, just kidding, but I am actually starting to get the hang of it. 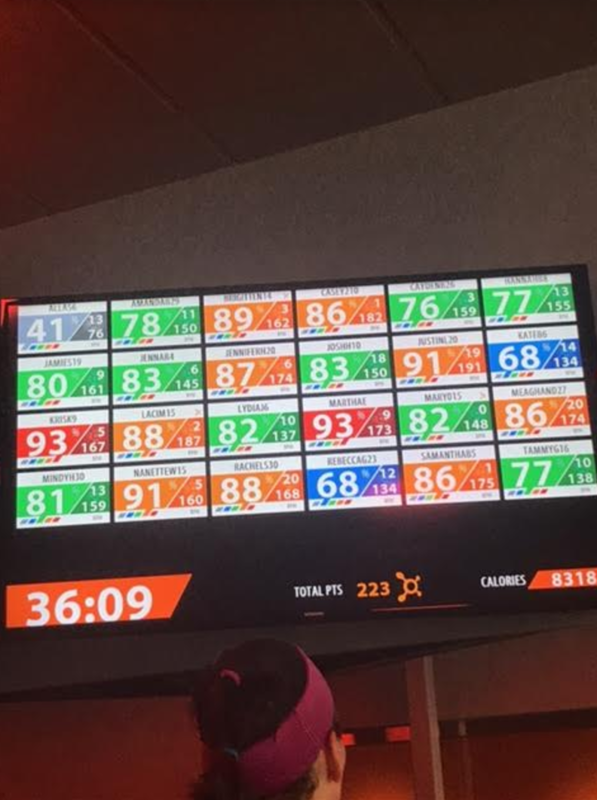 It’s super-motivating to see my heart rate displayed on the big screen, and I’ve been able to keep my heart rate in the orange zone for 12 minutes in almost every class. 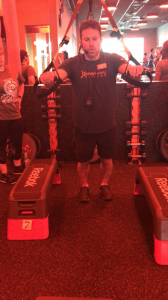 That means I am achieving the afterburn effect: the high-intensity training causes muscles to burn more calories and fat for 24 to 36 hours after the workout. I’m not sure if I’ve lost any weight so far, but I am definitely gaining strength, speed, and confidence. Martha checking out her stats. Coach Brittney Baldwin speeding up the pace. 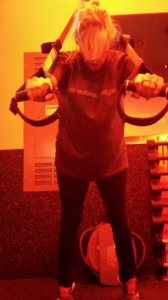 I also feel a lot more comfortable on the rowing machines and performing the strength training exercises. 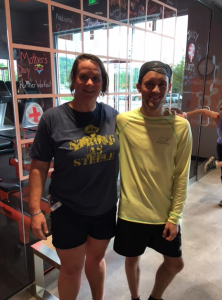 Aaron and Brittney Baldwin, the other awesome instructor at our Asheville studio have helped me dial in my strength training exercises in the weight room, as well as my rowing form. It’s really great to have the instructors right there guiding you along the way, and their emphasis on safety and orthopedic issues is reassuring for sure. They always demonstrate every exercise they ask you to do, and they also offer alternatives, which is helpful. I’ve been doing push-ups on my knees and I’m excited to say that I’ve finally done my first full push-up…just barely, but I did it! Coach Brittney demonstrating exercises. Coach Taylor keeping folks moving fast. Orangetheory emails me a performance summary with results after each workout, which keeps me motivated to keep pushing harder. They also mix up the classes each day with different themes and challenges. 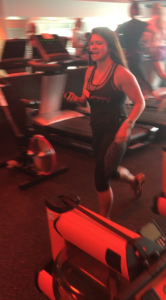 The other day we did a Tornado, where we rotated from treadmill to rowing machine to strength training at a fast pace. The time at each station was short and extremely intense, but the class flew by. It was probably the fastest and hardest 60 minutes of my life. It’s pretty cool that I’ve been going for two weeks, and that every workout routine has been different. 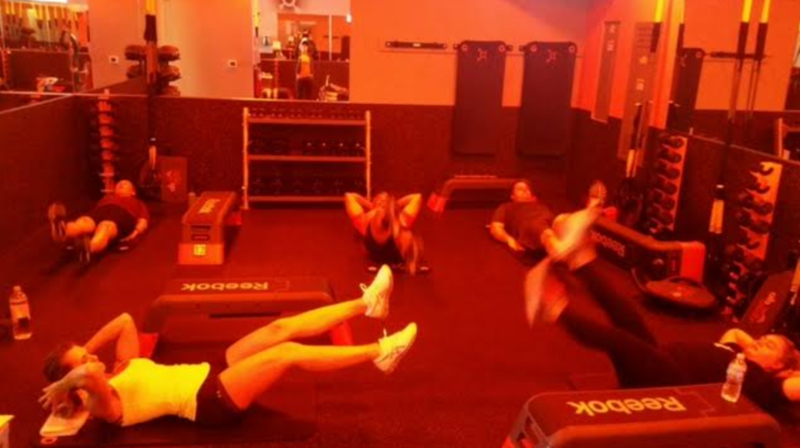 Scissor crunches being preformed on left. 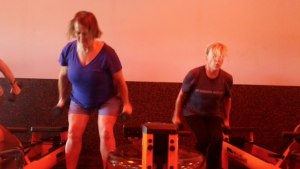 Weight routines between rowing sets on right. I never pictured myself as the kind of person who would attend an organized fitness class. But this feels different. It feels more like a community. 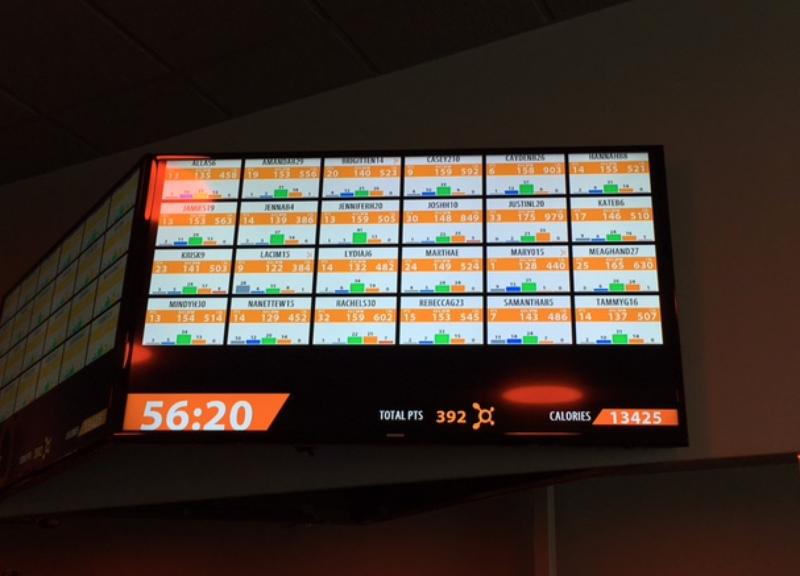 The diversity in the fitness levels of the folks attending the classes is comforting. Everyone is working hard and cheering each other on which is quite invigorating. The encouragement and the one-on-one instruction from the coaches is motivating and well, it makes me want to go back. One woman at our studio started out weighing over 500 pounds. It took incredible courage for her just to walk into the studio. 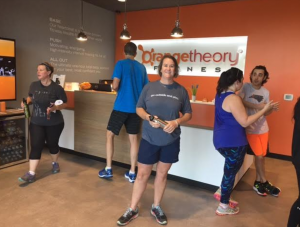 Six months later, she has dropped 75 pounds, and more importantly, she has found a community of friends and supporters where she feels comfortable and connected. 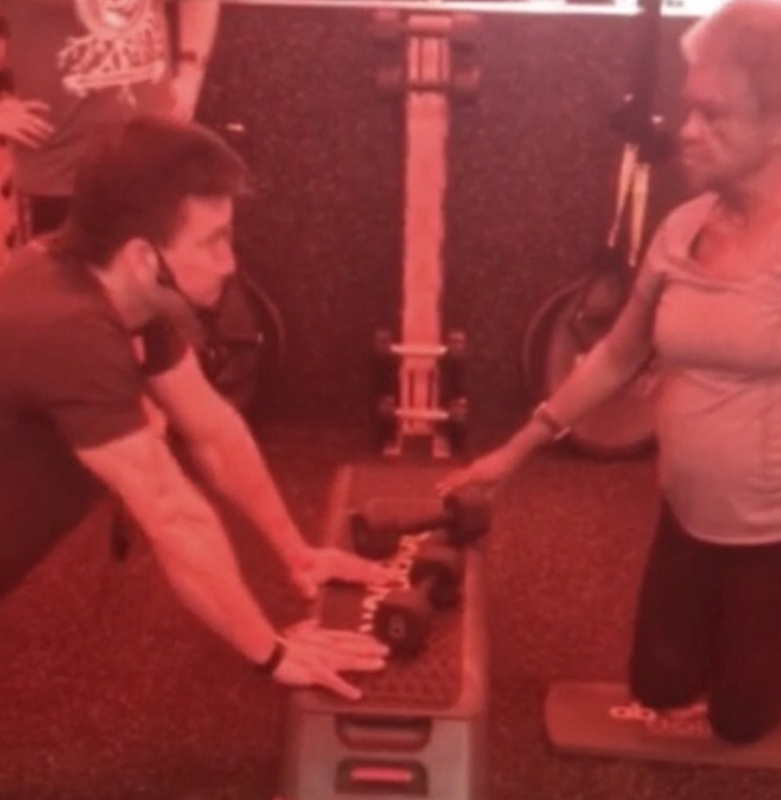 There’s also an 82-year-old woman who can rock out through some of the toughest two-minute treadmill sprints. Post workout pic with friends. End of class summary. 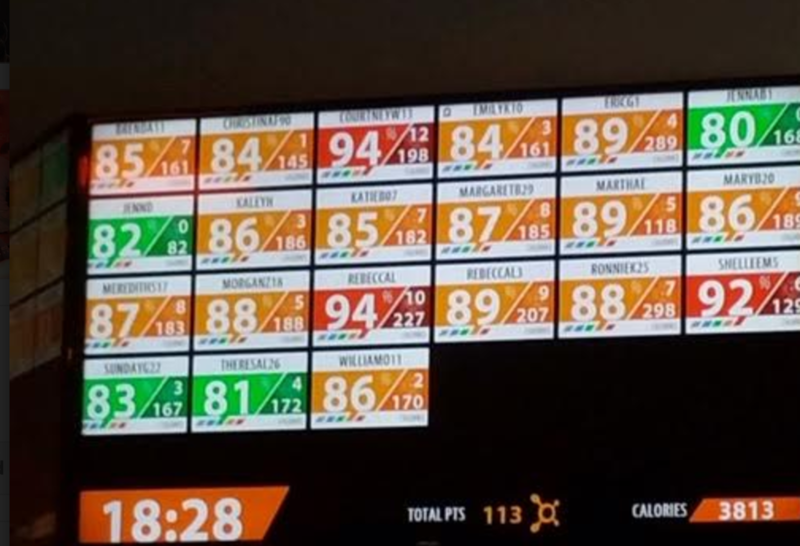 I am surprised by how much I like Orangetheory Fitness Asheville—and even more surprised by how much I like pushing myself. Brittney and Aaron, have helped me choose to power through and have fun, with their upbeat music and happy funny comments on the microphone. Just the other day, I found myself talking about my OT classes and performance with friends. I can honestly say – it’s addicting. And it’s the most motivated I’ve ever felt about my fitness. Coach Brittney getting folks laughing before class. Checking my stats while on the treadmill. 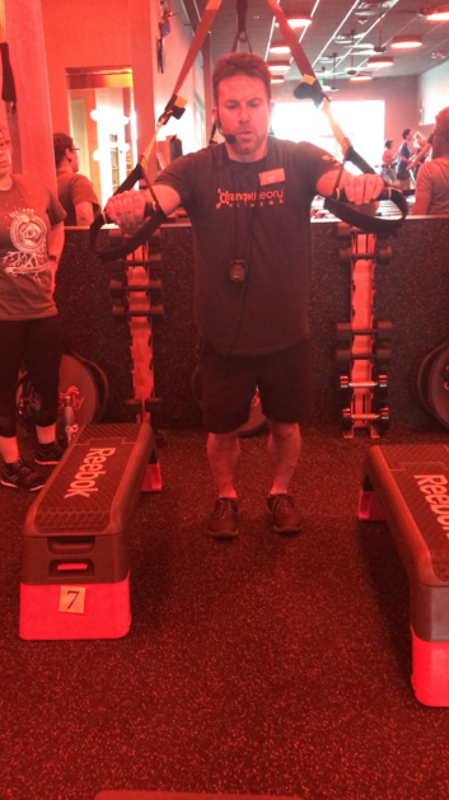 Coach Aaron demonstrating the weigth room TRX band exercises. Coach Brittney speeding up the pace. Coach Aaron giving his pre-class speach to get folks pumped up. Coach Taylor keeping folks moving fast. Doing weights between every 300m row. Coach Aaron explaining treadmill workouts. Post workout pic with new OT friend. ost workout pic with friends. OT screen – 36 mins. OT screen – 18 mins. OT screen – beginning of class as we start warming up.